Some days ago a website created havoc in Japan. Said to be created by a 10 year old it poses several questions to Abe regarding the snap election this December. 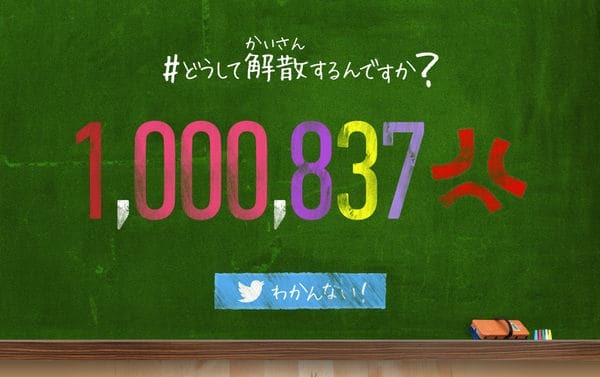 As the major part of the population in Japan does not see any reason for spending huge amounts of money in economically difficult time, this web site provided a sarcastic and humorous approach to it. The creator of the site was soon found – he didn’t use dns privacy, so his data was easy to be found in the whois database (hint hint for the next time! ), and it turned out to be a 20 year old student, heading a NGO for generating interest into politics in young Japanese, a noble endeavor in a country stricken by chronic disillusion and political negligence. To my surprise, the opposition parties did not support, but shunned the originator, and even Abe himself doesn’t have anything better to do than answering on FaceBook (the original link, it was removed since yesterday! ), insulting and criticizing the student, instead of actually answering the questions. Of course, because there are no answer, but getting and clinging to power what is what Abe wants to do, the only reason for this election. what the heck is the question? Surely, that the number of members of the Diet is a lot, says my papa. But in reality, the school teacher’s number is decreasing. Professor Watanabe, will he be ok? Either way, the members of the Diet, they are important! My pocket money does not increase! that is an easy thing. Hmm, whose money is that? ne, ne, can someone explain me. Prime minister Abe, politicians, TV, newspaper guys? Breaking a promise is fine? Wasting of money, doesn’t it make you angry? Why do you dissolve the lower house? – obviously, that is also a secret! Here the final “secret” probably points at the newly installed law installing Draconian measures against anyone releasing state secrets. Yes, good questions without an answer! Of course the Canadian rain coats are red, while the American raincoats are blue, not that we rescue the wrong ones!